Dean Gamble scored a try and kicked a drop goal for Featherstone Lions in Saturday's 37-20 win against South Wales. Picture: John Clifton. Winger Reece Dyas scored three tries as Featherstone Lions pulled off an upset to reach the Labrokes Challenge Cup fourth round for the second successive season. 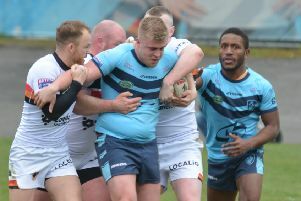 National Conference League Division One side Lions, the lowest ranked team left in this year’s competition, beat National League One South Wales Scorpions 37-20 at a packed Mill Pond Stadium on Saturday. Lions coach Jamie Rooney, a former South Wales player, steered the amateur outfit to an impressive win against his old club. Lions made an ideal start by storming into an early 16-0 lead. They led 22-4 at the break and weathered a brief South Wales comeback to finish the game firmly on top. Tries by Josh Hardcastle, Kieran Redfearn and Dyas put Lions in control. Scorpions opened their account with the first of winger Dai Evans’ two tries but Joe Fox’s 32nd minute effort and the third of Ian Jackson’s four goals gave Featherstone an 18-point advantage at the break. Dyas bagged his second early in the second-half before South Wales flicked briefly with two tries in six minutes from Chris Vitalini and Evans to cut the gap to 26-14. Dyas completed his hat-trick in the 68th minute and Dean Gamble went over four minutes later for a try that Jackson goaled put the game beyond South Wales. Rhys Davies scored a late consolation try for the visitors but Lions had the final word with Gamble’s last minute drop goal. Featherstone Lions: Jackson; Redfdearn, Hardcastle, Williams, Dyas; Johnson, Candlin; Curtis, Gamble, Millard, Fox, Gale, Frankland. Subs: Garahan, Nuttall, Gibbinns, Walker.